Rumor has it Sergio Garcia’s switch to Callaway played a role in the company’s introduction of these irons. If so… Thank you, Sergio! When Callaway acquired the Ben Hogan brand all those years ago, better players were curious what would come of the Hogan designs, names, and ethos. Callaway was, at the time, producing great clubs but was seemingly focused much more on game-improvement and super-game-improveement irons, while the Hogan brand targeted primarily better players with simple, austere designs that evoked a sense of history and longevity over fanciful new technology and flash. Would Callaway use the Hogan IP to bolster their better player lineup, or did they just want the Apex name and the Hogan designs, patents, etc.? For a few years, many feared it was the latter, as few clubs Hogan-like clubs were introduced, and even as recently as 2016 the “Apex” name was stamped onto clubs that didn’t resemble the old Hogans very closely. But, over the past several years, Callaway has seemingly boosted their stable of PGA and LPGA Tour pros. 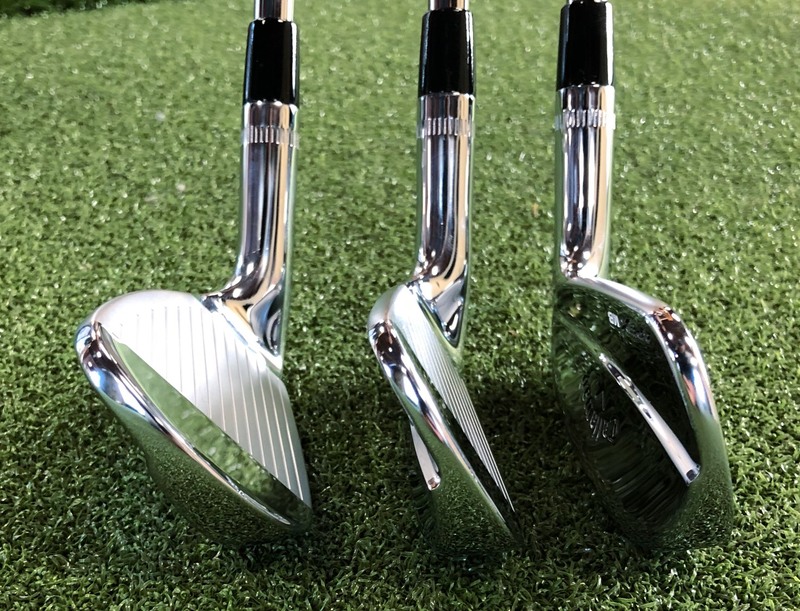 They’ve continued to introduce irons aimed at the game-improvement and super-game-improvement segments, but they’ve also strengthened their commitment to players clubs with wider releases of clubs designed for the better player. Look, I’ll be blunt here… We’re talking about a muscleback iron. There isn’t really any technology here. The shafts (Callaway offers a huge variety from Nippon, True Temper, KBS, Project X, etc.) have more technology… heck even the grips might have more technology in them than the iron heads themselves. Callaway even touts the 2018 Apex MB as “true musclebacks inspired by the Tour and suited for the best of the best players.” Not a single mention of technology, forgiveness, new space-age materials, or anything. Essentially, the club has a thin topline, a thin sole, a small head, and a slight “curve” or “swoop” in the muscle on the back of the iron blade. I’ll talk about that more in the Esthetics section. 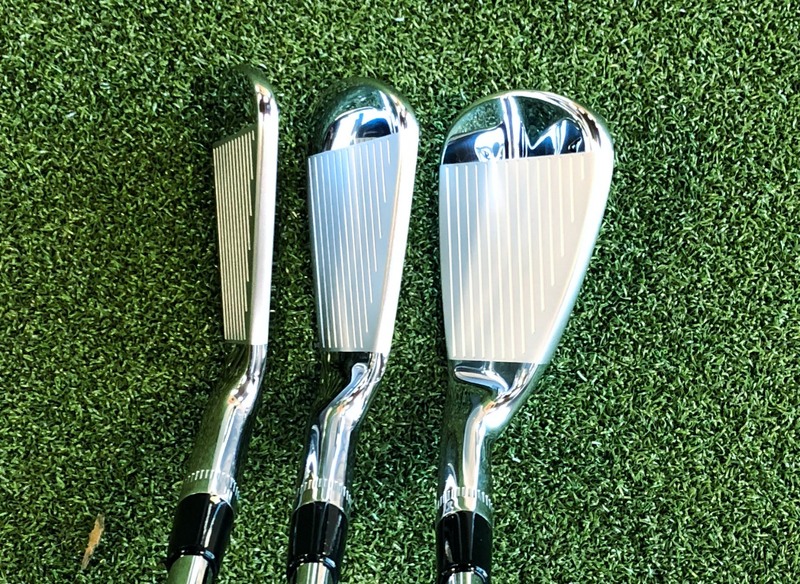 Completing the trifecta of muscleback/blade “technology,” following the shape of the club, and the V-grooves, we have the kind of steel used in making the iron heads themselves! 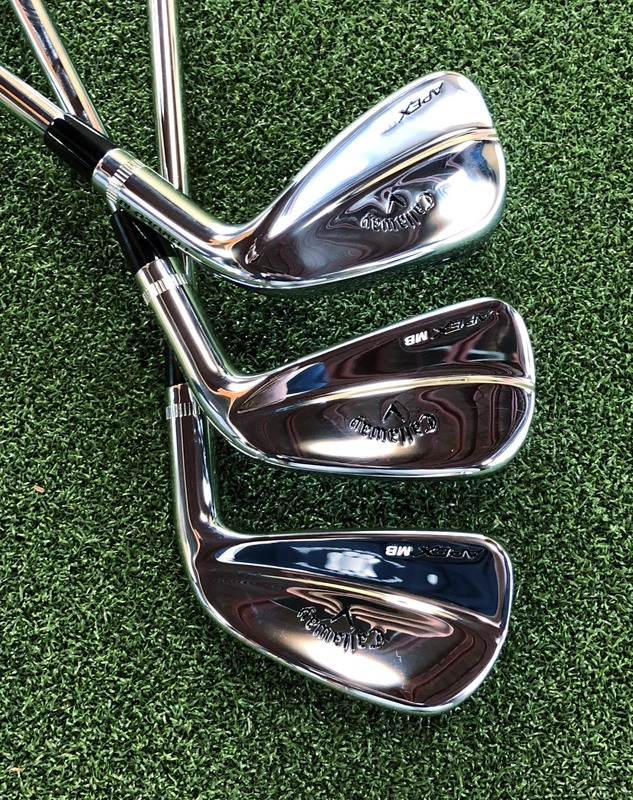 As you may know, if you’re a fan of this type of iron, the 1025 Carbon Steel is often touted as having “a remarkably soft feel that Tour players want…”. 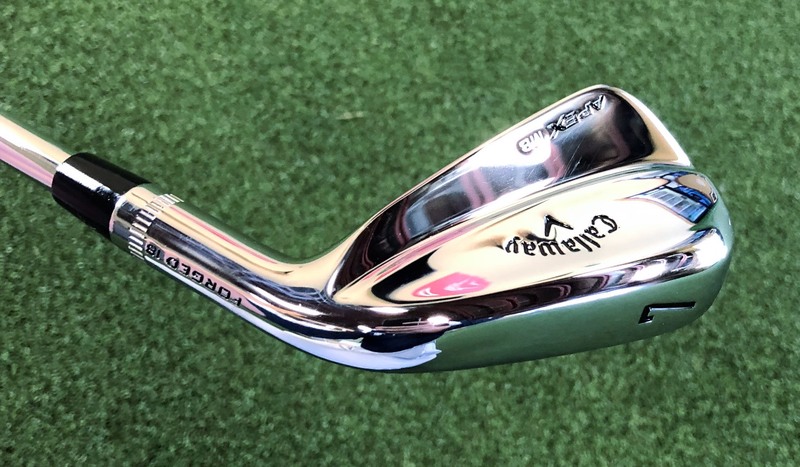 Callaway achieves this “exact craftsmanship and precision they expect” through their “premium forging process.” The takeaways? They’re 1025 Carbon Steel forged blades. Cool. Seriously, though, I’m not trying to be dismissive. There’s just literally nothing to talk about here. While some companies are happy to blend tungsten into the toes and heels to bump up MOI a little, or play around with the shape of the muscle (Titleist’s short-lived “ZM” springs to mind, as do a few of Callaway’s previous musclebacks), Callaway is content to deliver what muscleback fans want: a small, simple, solid, soft blade for better players. Muscleback fans don’t want a lot of “tech” in their 5-iron. So, kudos to Callaway for building just that: a small, simple, solid, soft blade for better players. As for the specs and availability, the 2018 Apex MB is available in men’s righty and lefty clubs through the range of 2I-9I, PW, AW. Through the Callaway “Build & Buy” site or your favorite local retailer, you can choose a wide variety of grips and shafts. 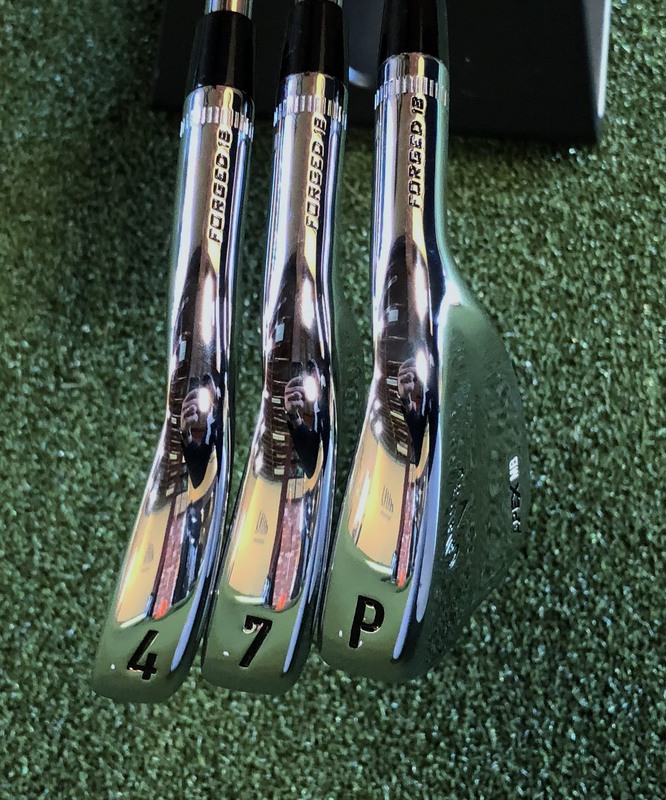 The shaft options, for example, include a vast array from KBS (S-Taper, C-Taper, Tour, Tour FLT, Tour V) of varying weights and flexes, the Nippon Pro Modus 3 Tour 105, 120, and 130, Project X (LZ, PXI, PX) of varying flexes, and True Temper (Dynamic Gold X7, Pro, SL, Tour Issue AMP, XP, etc.). The test set was shafted with a pretty standard Project X 6.0. My test set of irons were 3-PW (I have a 48° Edel wedge, so I don’t typically hit the set PW) with Project X 6.0 shafts and a standard Callaway cordless, ribless, all-black grip. As with the Technology section, there won’t be much here. That is, again as with the Tech section, exactly as it should be. These are muscleback blades. And what good looking blades they are! Oh my. Callaway has paid attention and designed an iron that good players will love to look at from every angle. Even the ferrule is perfect – a solid black ferrule without any rings or decoration. Below the ferrule, at the top of the hosel, you’ll find a series of little dashed lines that circle the hosel. These marks or grooves are reminiscent of the time when clubs were hand assembled, and a little texture in the hosel was helpful in grabbing the iron head for assembly. On the back of the hosel, below the “clubmaker marks, a simple “FORGED 18” is paint filled in black. The back of the blade has the Callaway logo and chevron toward the sole, and “APEX MB” in black (“APEX”) and white (“MB”) on the high toe. The thin sole is decorated simply with a thick, black paint-filled number or letter toward the toe. This club effectively has only shades of black and white. The clubface has a softened, misty silver application common on the faces of irons. This treatment wraps around the top to make the already thin topline appear even thinner. The rest of the club, except for the few paint filled areas noted above, is a lustrous, high-gloss, shiny polished silver that dazzles. Though it picks up fingerprints and smudges quickly, it wipes clean quickly as well with a towel, shirt, or napkin. You can see a bit of the “scoop” in the muscle here. At address, the hosel flows neatly into the topline of the club without a pronounced valley or change in the slope. The relatively short blade length and thin topline will appeal to good ballstrikers. Combined with the thin sole will encourage players to play a variety of different types of shots from a variety of lies. 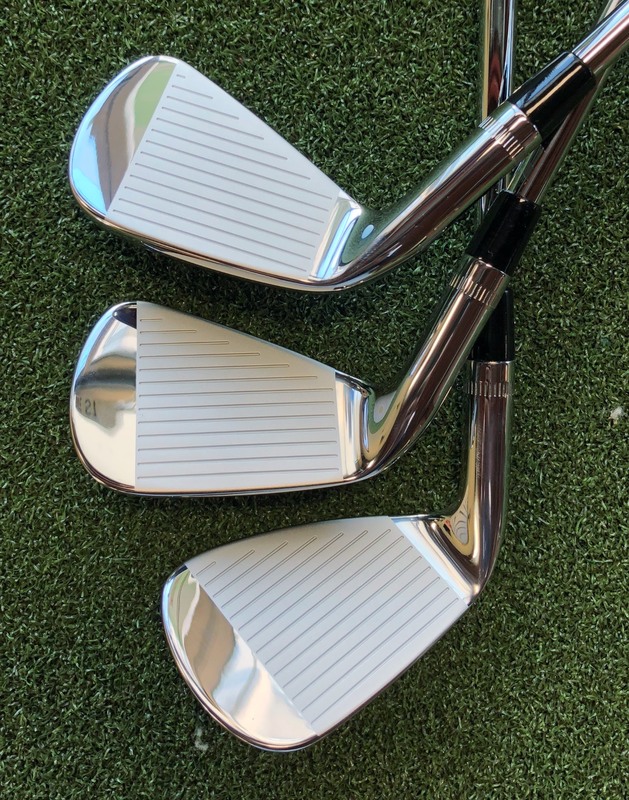 In short, these 2018 Apex MB blades look like clubs that are going to look great in your bag or at address, and feel great when you flush one toward the flag. Control. This means of trajectory, distance, and shot shape. Looks. The club should be relatively small, unadorned, and simple with a thin topline. Feel. The club should feel great when you flush it, but should let you know when you mis-hit the shot, even a little. Versatility. This is primarily an aspect of the thinner soles typically found on blades, though if you’d like to put trajectory manipulation in this category instead, be my guest. The looks I’ve commented upon above, and you’re welcome to judge for yourself. (Though, if you don’t agree that these are some sick looking blades, we can’t be friends. I’m sorry.) So when I talk about “performance” I’m talking about those other aspects: control, feel, and versatility. Of course, I’m not going to talk much about forgiveness. If you want a lot of forgiveness, you’re not looking to play a pure blade muscleback. A set of butter knives aren’t for you. So that leaves the feel, control, and versatility. I noted up above that control includes both control of trajectory as well as distance, and I can see some of you in the audience scratching your heads over this one. Isn’t distance control simply a result of the strike itself? If you hit the ball the same way, every time, the ball should go the same distance each time, no? Theoretically, yes. But in my time playing golf I’ve had a lot of experiences in playing a cavity-back or non-blade iron where I’ll hit a shot that feels great, and somehow flies eight yards farther than I thought it should. Now, you skeptical head scratchers in the audience will note, correctly, that I’m not a robot. 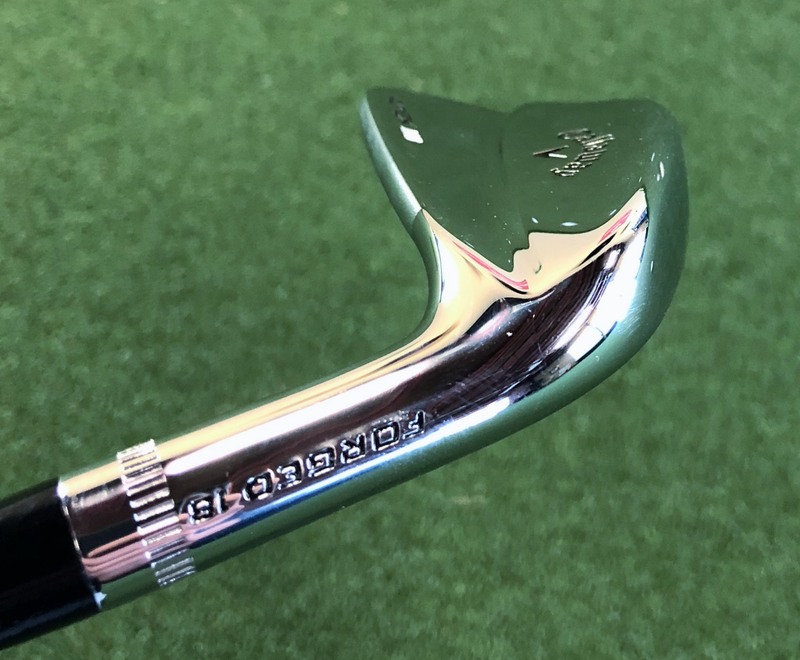 But long-time industry guy Terry Koehler had a robot – Iron Byron – when he was coincidentally developing a new Apex iron for the Ben Hogan company in the mid-90s. He set Iron Byron to hit some cavity back irons, then set the same strike conditions to hit a muscleback blade. His pattern on dead-center hits with the cavity back was 8′ wide and 15-17′ long. That struck him as odd, and so he tested heel hits and toe hits, and compared the results to the Apex blade they were simultaneously developing. What he found was, well, I’ll let him finish out the story. Then I looked at the chart for the new Apex blade we were developing. On heel misses, it was slightly worse than the cavity back models. On toe misses, the Apex was significantly worse (blades have very little mass out on the toe). But on dead center hits – our shot pattern was about 1/4 the size of the cavity back pattern! In other words, the perfect shots were much better! In other words, in the hands of a better player, blades will often make up for in control what they lack in ultra-forgiveness. Some of the reasoning for that distance control may be because trajectory control is so much easier with a blade than a game-improvement club. With a higher center of gravity than most other clubs, the Apex MB doesn’t resist hitting a shot low like so many other clubs. If you’ve ever tried to hit a stinger with a super-game-improvement club, with thick soles, tungsten weights, and all sorts of “help” for the average golfer to get the ball in the air with less spin, you know how tough it can be to flight the ball down when the club is working against you. The Apex MB puts you in the drivers seat. It is, in the best senses of the words, a piece of metal on the end of a stick. It does your bidding. It does exactly what you instruct it to do. If you want to hit a 150-yard shot that never gets more than fifteen feet off the ground, you can do that. 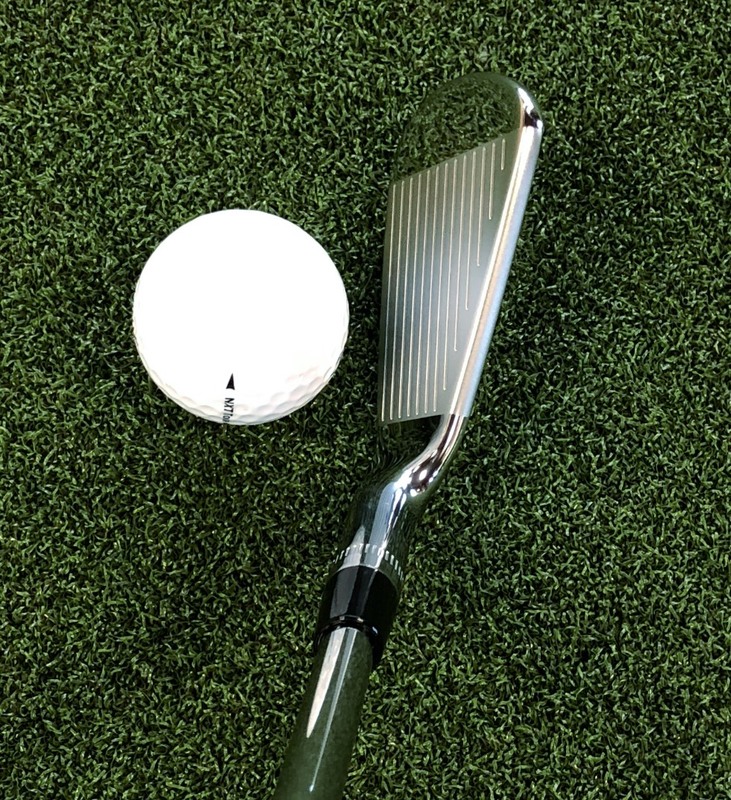 With the thin sole, if you want to lay a face open a bit and hit a high soft cut, the club isn’t going to catch the back of the sole and skip into the ball a dimple or two high. It’s going to let you work that high shot just as easily as it lets you work the low one. That’s versatility in action. As for the feel, it’s as good as any blade I’ve played, and better than a lot of them. 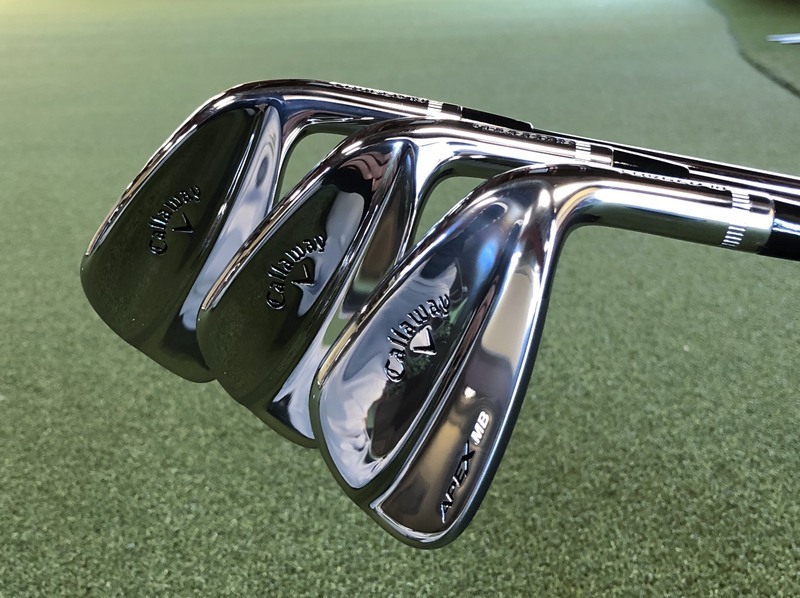 Though Callaway hasn’t published the bounce specs on the Apex MB, it’s evident from a quick side-by-side comparison that it has more than most musclebacks, including my Miura Tournament Blades(3° in the 4-iron, 5° in the 7-iron, and 8° in the PW). Bounce, even on an iron, is still essential for getting the club out of the ground cleanly. You don’t want so much that the trailing edge contacts the ground much before impact, but very quickly afterward you want the trailing edge to help get it out of the ground for a thin, shallow divot. The Callaway 2018 Apex MB, in my opinion, absolutely pegs this one. Musclebacks generally have gotten a bad rap as far as forgiveness, but it wasn’t only the small MOI that made them difficult. It was usually the super high-heel cg and dig soles that really added to the problem. It forced you to get the ball up into the face but not catch it a millimeter fat. That’s a very narrow window for delivery. If you shorten the hosel and lengthen the blade a bit to pull the cg down toward the middle, and then add some bounce, the 5-P become pretty manageable for most decent players. The 2-4 will always be challenging… for sure, if you want to hit a high draw. I’ve said throughout this interview that these clubs aren’t forgiving, and that remains true compared to every other type of iron. Musclebacks are the least forgiving type of irons out there; that’s simply the nature of the beast. What you gain in control and feel, you give up in forgiveness. But the bounce does help these irons to be about as forgiving on slight mishits as possible. Dave Wedzik and I have popularized (or tried to) the thought that bounce is actually better called “glide.” On a slightly heavy hit, say, even an eighth of an inch, a club with a bit more bounce will resist digging into the ground, and will glide along the top just a bit longer. This keeps your clubhead speed up a bit, and helps you to contact the ball on the sweet spot, not above it, just a little bit. To Callaway’s credit, they augmented the narrow soles by adding a bit more bounce than you typically find in a muscleback blade iron. At any rate, these Apex MBs not only look great, and perform great, they feel great as well. Slightly heavy shots aren’t punished, and the bounce creates a solid sound and feel even in softer conditions, without being anywhere near too much for the firmest links land in Scotland or Callaway’s PGA Tour players (rumor is that Sergio Garcia’s defection to Callaway and the introduction of these clubs is not a coincidence). Whether I can thank Sergio Garcia or the hard-working folks at Callaway, I don’t really care. I owe them a thanks all the same. Thank you, Callaway, for introducing a classic blade. Thank you for rethinking the bounce and CG locations. Thank you for not making this a Tour-exclusive, and for giving better players a compelling reason to go Callaway throughout the entire bag. The 2018 Apex MB are a forged, muscleback blade. They’re not comprised of a bullet list of innovative features. They’re not multi-material (well, there’s metal, paint, and a plastic ferrule… does that count?). They’re not even numbered with lofts instead of iron numbers. What they are is a solid, great-looking, versatile, controllable blade for the 21st century. They cater to a better player while expanding that definition ever so slightly with a bit of added forgiveness. 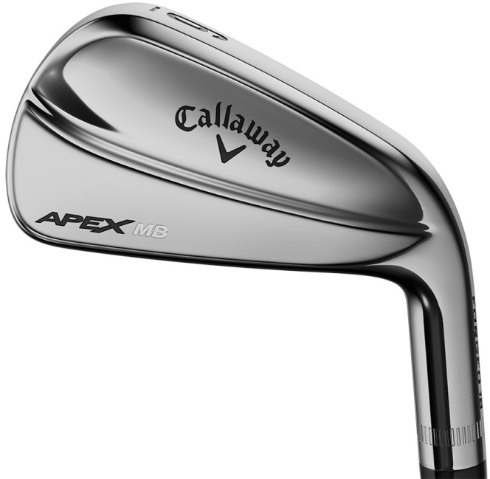 If you play blades, or are looking to get into a set, the 2018 Apex MB from Callaway deserves a spot on your short list. What a fabulous review Erik. I work at a Golf shop with stores across Canada and get the chance to hit EVERYTHING. When the MBs showed up I fell in love. The simplicity of the design blew me away but even more so was the shape of the heads. I have never been a fan of irons that had what I call an elbow, where the top line is higher when it meets the hosel. The Mbs are shallow at the hosel and for what ever reason I find that very appealing. But, when I hit them, I had to go for a cigarette after (and I don’t smoke). The feel was like nothing I triedbincluding Mizuno MPs and the MB14s ((which I currently use). I am not a great golfer (legitimate 5) but I believe many make this club out to be more difficult than it really is. Thanks for the fabulous review and keep you candid/honest posts coming! Thank you for the read, Bobby. I agree with all you said – these clubs are pretty sweet, and you don’t have to be a +2 to enjoy them.